Testing of the Internal Model. Undertake analyses to provide impactful insights as part of model uses or to ensure continued appropriateness of the model. Coach and act as a referral point for other members of the team and other departments in respect of technical actuarial matters. Provide efficient application of the core Igloo based Internal Model – including interpretation and development of modelling code. 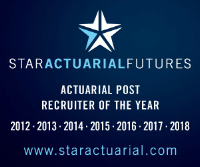 3+ years’ actuarial experience in General Insurance. Excellent analytical & mathematical skills. Strong communication skills, with proven ability to build effective relationships and to influence key stakeholders. Ability to work to a high standard with minimum supervision. Demonstrates sound and commercial judgement with an ability to design practical and proportionate solutions. Record of success in Capital Modelling – helping identify and deliver opportunities to add value. Proficiency in the interpretation and development of modelling code (ideally Igloo). Please contact Lee.Houser at Mazars if you are suitable.